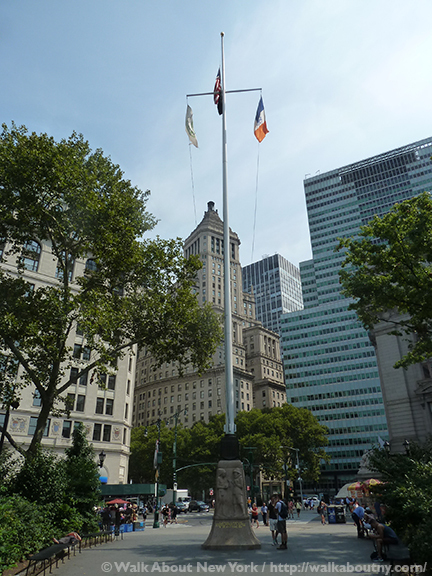 Flying from the Netherlands Monument are the U.S., MIA, NYC, and City Parks flags. Although in 1664 New York was named for Great Britain’s James, Duke of York, when his brother Charles II gave it to him, the City That Never Sleeps has Dutch roots. First called Nieuw Amsterdam (New Amsterdam), the primary settlement in the Nieuw Nederland (New Netherland) colony, the town was founded by the Dutch West India Company in 1624 as a fur-trading center. The Netherlands Monument at dusk. Englishman Henry Hudson (1565?–1611?) went exploring for the Dutch East India Company, seeking a shortcut to the spice-rich lands of the Orient. He sailed his ship, De Halve Maen (the Half Moon), into what would become known as New York Harbor in 1609. The river (geologically really a fjord) he followed as far north as present-day Albany, capital of New York State, is named for the explorer. 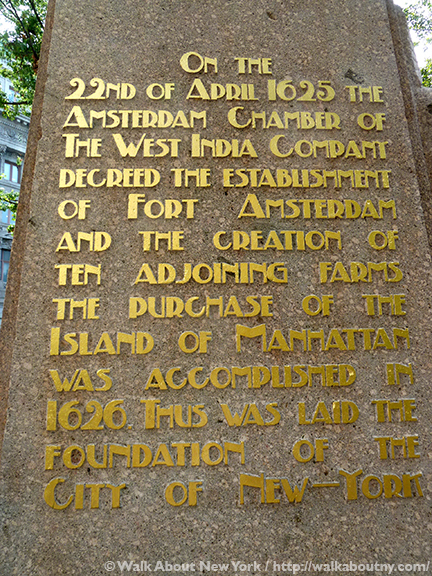 Establishment of the Dutch West India Company by the States General of the Netherlands in 1621 allowed Dutch families to set-up a small community at the southern tip of Manhattan Island three years later. And the Greatest City in the World was born! 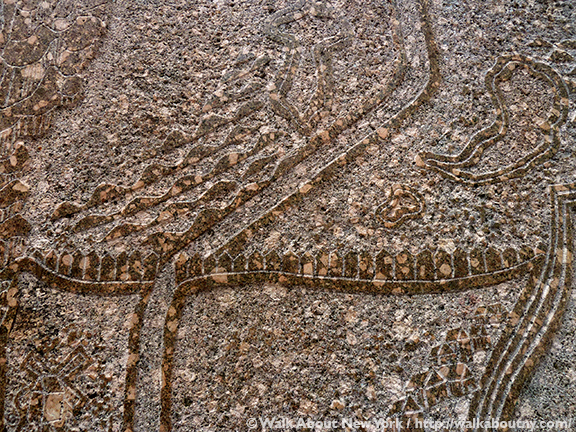 A high-relief depiction of the mythical purchase of Manhattan Isle. By the year 2000 New York citizens of Dutch ancestry made up only three tenths of one percent of the population. Though their numbers are small, the Dutch have had extensive influence on New York. Brooklyn (Breuckelen), one of New York’s five boroughs; Harlem (Haarlem), a Manhattan neighborhood; Coney Island (Conyne Eylandt), a “Breuckelen” neighborhood; and the longest roadway in the city, Broadway (Breede Wegh) trace their origins to Dutch. An explanation about how New York got its start. Many New York City streets (Beekman, Cortlandt and Nassau Streets) and parks (Van Cortlandt Park in The Bronx), as well as New York’s professional basketball team, the Knickerbockers (the Knicks) derive their names from Dutch. Some of the city’s oldest architecture is Dutch; the Dyckman Farmhouse, circa 1785, in Upper Manhattan and the Wyckoff House, circa 1652, in Flatbush, Brooklyn serve as reminders of the New Netherland era. Most importantly, New York City’s dominance in commerce directly stems from its Dutch past. It has been a business city from the start. An explanation of how New York got its start, in Dutch. Another characteristic New York carried to the 21st century from its Dutch beginnings is that of diversity. Not only were there Dutch in habitants of New Amsterdam, but many Africans, free and enslaved, Scots, English, Germans, Scandinavians, French Huguenots, Muslims, Jews and Native Americans too. Less than 20 years after its founding New Amsterdam’s several hundred residents spoke 18 languages among them. The melting-pot tradition continues. 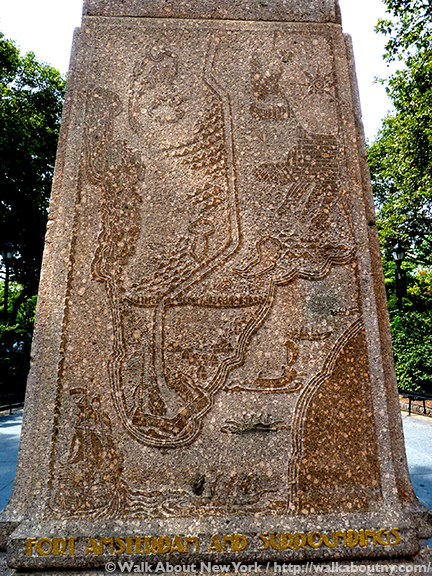 The Castello Map is depicted on one side of the monument. 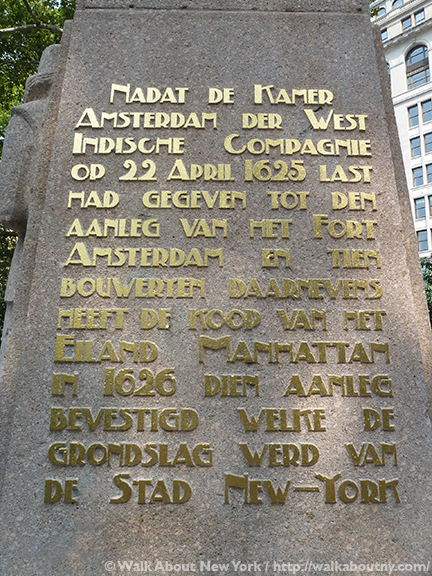 Dedicated in 1926 to mark the tercentenary of the founding of the Dutch settlement of New Amsterdam, the Netherland Monument Flagstaff commemorates the 17th-century Dutch settlement. H.A. van den Eijnde (1869-1939), a sculptor fittingly from the Dutch city of Haarlem, which gave its name to a Manhattan neighborhood, albeit with only one ‘a,’ designed the monument. Its pedestal is carved from Bencha granite; the base is cast of bronze. Detail of the Castello Map, Fort Amsterdam at the tip of Manhattan Isle. On one side of the granite pedestal is a high relief. 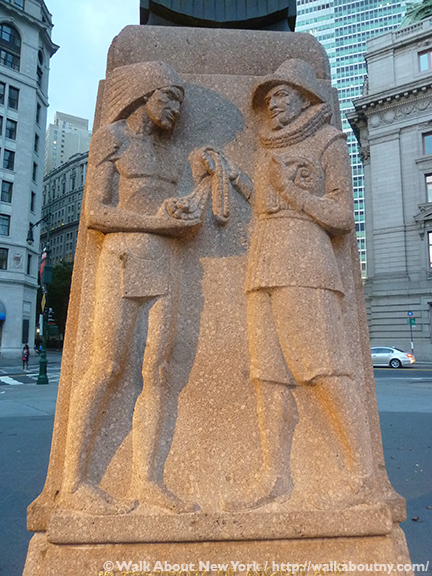 It depicts the mythical purchase of Manhattan from Native Americans, the Lenape people, by the Dutch provincial Director General Peter Minuit (1580–1638). The Dutch supposedly bought the island for goods, iron kettles and axes among them, valued at 60 guilders. That amount was calculated, more than 200 years later, using the prevailing exchange rates, to be equal to $24. Like all Native Americans the Lenape did not share the European concept of land ownership. It is unlikely that they believed they were selling Mannahatta, as the Lenape called Manhattan Island, to Herr Minuit. Because of this and other cultural differences, the Dutch regularly found that they were fighting with local tribes. Running across the Castello Map is the wall that once stood where Wall Street is. New Amsterdam prospered as it grew; but the threat of attack from Native Americans or the British was ever-present. In 1653 a fortification wall was built, running from the Hudson River to the East River. The British demolished the wall in 1669, creating a street in its place; they called it Wall Street. And we still do! Opposite to the flagstaff monument stands the 1911 U.S. Custom House, today housing National Museum of the American Indian; the land where the museum sits is where Fort Amsterdam once stood. The coat-of-arms of the City of Amsterdam at the base of the flagpole. 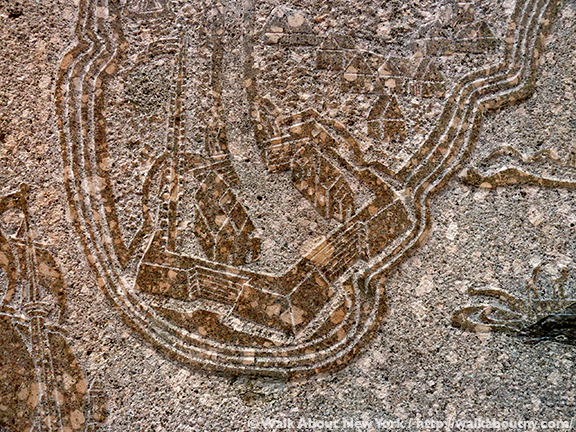 These 17th-century sights are shown on a replica of the Castello Map, drawn in 1660, that is chiseled on one side of the Netherlands Monument. The map was found in 1900 at Villa di Castello, a palace near Florence belonging to the Medici family. In 1667 a Dutch mapmaker sold the map to Cosimo III de Medici, Grand Duke of Tuscany (1642–1723). That is how a Dutch-made map of an American colony came by its Italian name. 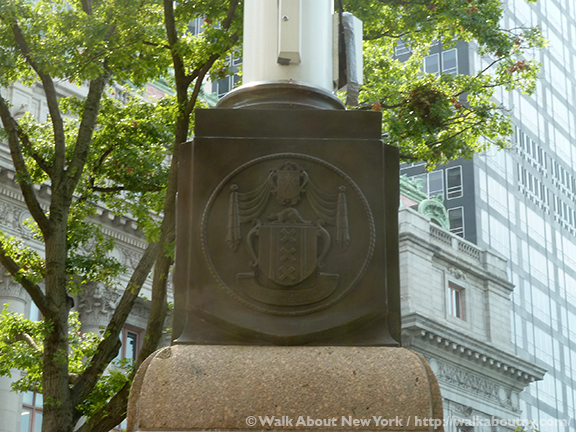 The Seal of City of New York at the base of the flagpole. It is fitting that Saint Nicholas Day, December 6th was chosen to dedicate the Netherlands Monument. Saint Nicholas is the Patron Saint of sailors; the Netherlands and New York became rich and powerful because of their relationship to the sea. New York’s Mayor James J. Walker (1881–1946) accepted the gift of the monument, which was first placed near the Battery’s New York Aquarium, housed in what is now Castle Clinton. 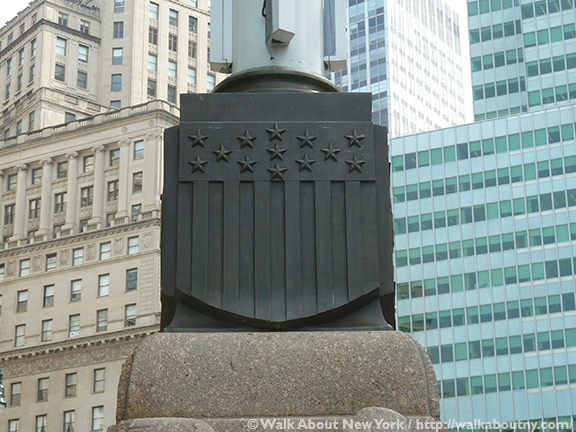 In 1952 the monument was relocated to its present site, the northeast entrance to The Battery, where Broadway begins and Battery Place and State Street meet. The coat-of-arms of the Netherlands’ Royal House of Orange-Nassau at the base of the flagpole. 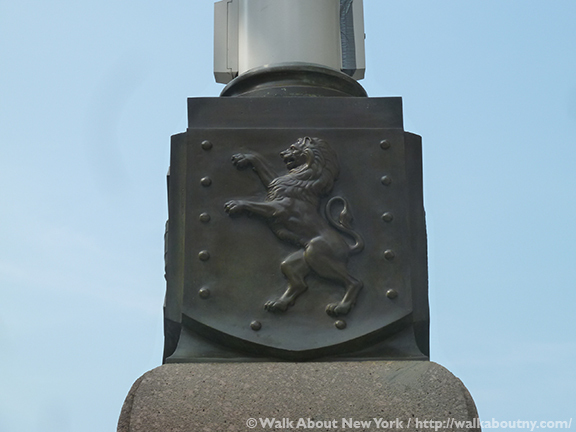 Above the granite pedestal is a bronze base for the flagpole. The four-side base depicts the Stars and Stripes of the American flag, the Seal of the City of New York, the coat-of-arms of the City Amsterdam, and the lion rampant on the coat-of-arms of the Royal Family of the Netherlands, the Royal House of Orange-Nassau, which has ruled the country since the 16th century. The Stars and Stripes of the American flag at the base of the flagpole. 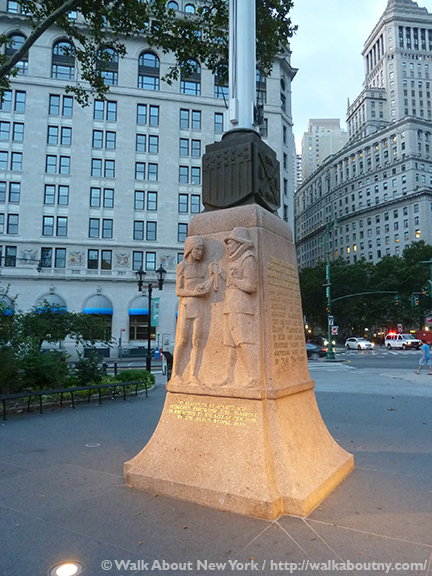 The Netherlands Monument is one of many sights you will discover when you are part of our Downtown Manhattan Walking Tour. 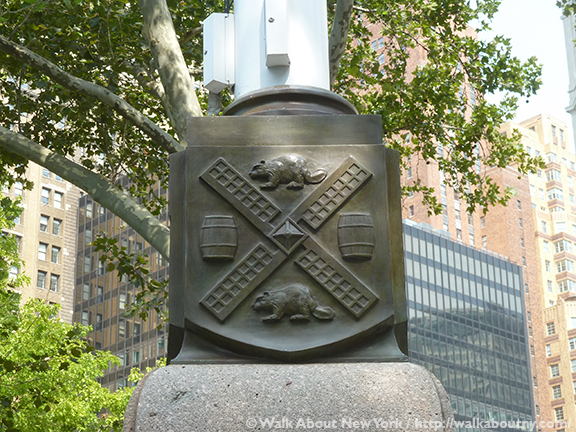 Where in Downtown Manhattan was the New York Aquarium, first site of the Netherlands Monument? Take the Tour; Know More!